Have you ever woken up in the morning snuggling with your significant other? Waking up happy, relaxed and comfortable as reality begins to roll back in ? As you’re thinking, “How could life be any better?”, when a devastating new thought pops in your head. The reality of your offensive morning breath rushes to the front of your thoughts. Now that could be an ugly end to a perfect moment. Being careful to keep your mouth shut, you hurry to the bathroom to begin your morning ritual. Sound familiar? The big question is why do we have morning breath? The main reason for morning breath is from a lack of saliva. When we sleep, saliva production slows down. Saliva is what is needed to wash away bacteria, food particles and acids from your mouth and teeth. As your mouth begins getting dryer, bacteria flourish, causing bad breath to increase. What Makes Morning Breath Worse? Everyone has a degree of bad breath when they wake. The degree of your morning breath can be affected by many things. Mouth Breathers are susceptible to bad breath. When your mouth is open, it becomes very dry causing the bacteria in the mouth to flourish. This happening over an 8 hour period can make for a foul smell come morning. Many medications cause dry mouth. Medications such as Aleve or Advil Cold and Sinus, Benadryl, Lipitor Tabs or Omeprazole can cause your mouth to become more dry. If you are a person using one of these medications, you might be affected by dry mouth which will in turn increase morning breath. Another indicator of excessive morning breath is a person with gingivitis or periodontal disease. These conditions indicate that food, plaque and bacteria has entered underneath the gums. As saliva production reduces, this condition will intensify a persons morning breath. How Do You Reduce Morning Breath? There is not much that can be done to eliminate bad breath in the morning but it can be made better. Brushing and flossing your teeth before bed is important for removing excess bacteria from your teeth. As we mentioned, bacteria flourishes in a dry environment. Removing as much food particles and bacteria from your mouth before bed will help the problem. The use of a tongue scraper at bedtime is also helpful as it too will eliminate bacteria from your tongue. Drinking a glass of water at bedtime is also helpful. Keeping your body hydrated is good for your health and well as your teeth. If you have diabetes, the number one thing you can do for your oral health is keep your blood glucose levels as normal as possible. Here’s why: When your blood glucose levels are poorly controlled, you’re more likely to develop gum disease and lose teeth than people who don’t have diabetes. In turn, gum disease could cause your blood sugar to rise, making your diabetes harder to control. So it’s imperative that you keep your teeth and gums clean by brushing twice a day and flossing daily. And if you wear dentures, remove and clean them every day. Keeping up with twice yearly dental visits is also crucial for patients with diabetes. A professional cleaning is the only way to remove the plaque and tartar that lead to gum disease. Also be sure to discuss your diabetes status and current medications with your dentist at each dental visit. Also keep an eye on other symptoms that might develop, including white patches on your tongue, which could indicate oral thrush, an infection caused by fungus that grows in the mouth, and soreness and ulcers in the mouth, which could be a sign of dry mouth. If you notice any of these symptoms, see your dentist. 1. The toothbrush is dry. It’s tough to keep the toothbrush dry if you’re actually brushing! Make sure to check your child’s toothbrush every day (and night ) – before it has time to dry. 2. You can still see food particles. 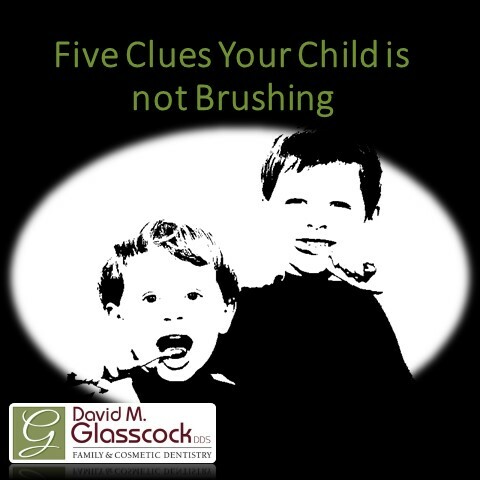 After your child has brushed, ask for a smile. If you can still see bits of food on or in between your child’s teeth, send your child back to the bathroom for a do-over. Have your child wet his or her finger and rub it quickly across the outside and inside of his or her teeth. If the teeth are clean, you will hear a squeaking sound. 4. Breath is everything but fresh. If your child is brushing and flossing regularly, his or her breath should be fresh. The foul odor associated with bad breath is most often caused by food particles — either food left in between teeth or food trapped in the grooves on the tongue. 5. Your child has a toothache. Even if you can’t tell if your child is brushing well, a toothache is a red flag. Make sure your child sees the dentist right away – a filling or other treatment may be in order. Remember, brushing is just one part of your child’s total oral health regimen. In order to remove stubborn plaque and tartar buildup and prevent other dental problems, regular exams and cleanings are a must. Plus, your dentist can help reinforce the importance of good oral hygiene with your child.